Reader analytics investigates the way we read. Reader analytics focuses on understanding how you the reader engage with specific books: if you open them, if you read them, if you finish them, how long does it take you to finish, do you recommend the books and much more. Reader analytics depends on data collection, specifically the collection of reading data through a small piece of software embedded inside the ebook (and no, there is no such solution for printed books). The goal is to better understand the connection between book and reader and to develop not only better books, but better connect the right books to the right readers, a problem known as the discovery problem of books. How do I know, if I am being tracked? When you are invited to a test reading campaign, you will be clearly advised that you are receiving a free ebook with tracking software embedded by Jellybooks. This embedded file is called candy.js and is part of your ebook. Ebooks and ebook samples that are distributed by Jellybook also display a narrow, multi-coloured “candy stripe” visible at the bottom of the. This candy stripe tells you which ebooks in your digital library contain tracking software from Jellybooks. You will also find a reference and explanation of reader analytics on the first page of the book after the cover. In the rare case where you receive a retail copy (a book you purchased and that has candy.js embedded) there is also a yellow button for switching off the data recording completely. 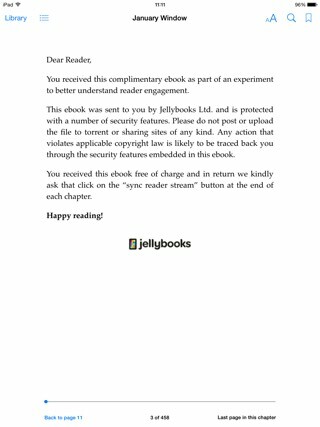 This button is not present in advance reading copies or complimentary copies that you receive from Jellybooks for free as part of a test reading campaign where you explicitly promise to send us your data. Whenever reader analytics is present and active, you will see a purple “Sync Reading Stream Button” at the end of the book and at the end of most chapters, which changes to “Thank You” when clicked. Note that the data we collect is stored locally on your device and is only extracted and transmitted to Jellybooks when you click the “Sync reading data” button. You are in control of the transmission. It is not done automatically. You can see all the data we collect through the “My data” tab on Jellybooks (you will need to log-in to your account to see it). We are also working on tools to bring the data to life for you the reader, but this is still work in progress. Right now you can see a calendar view of your reading times and how far you progressed through the book, but we will be gradually adding more and more visualisation tool for readers just as we have done for authors and publishers. You might want to check out this New York Times article. We can even recombine the data if you are reading across different devices, i.e. you are reading part of the book on your smartphone and other parts on your tablet. Just make sur you click the Purple “Sync reading Stream” button on each device after you have stopped reading on that device. Some people think that we employ eye tracking software. No we don’t. We record the interaction between you and book via the ebook reading app. How is this helping Authors and Publishers? The purpose of reader analytics is to help authors and publishers understand their audience: who is reading books, how are they reading them, how can the book be improved and how can we reach the readers who will be genuinely interested in this book? Completion rate – how many readers finish the book? A strong narrative grips readers and doesn’t let them go until they have completed the book. Strong stories have high completion rates. Velocity – related to completion rate, but a bit different. How long does it take reader from start-to-finish. Do you read the book in a single setting, do you come back to the book every day or do you only read it occasionally on a weekend or spread out over many weeks? This tells author and publisher a great deal about how strong the spell is that the book casts over you. Snacky or Immersive – do you get lost in the book for long periods of time or is a book you read for periods of thirty minutes or less. Is it a book that works well for the daily commute or a week-end binge? Good to know for the author and publisher in terms of where there books are read. 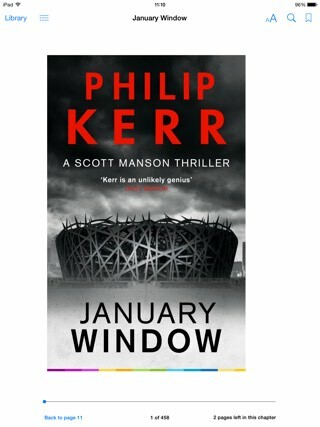 Demographics – is it young or old readers, woman or men who read the book? It may look obvious whom the book should appeal to, but reality is often different. We tell the author and publisher who their readers really are. Recommendation Factor – readers generally only recommend books they have finished, but even then opinions vary, we are much more likely to recommend some books than others. The recommendation factor is a measure that helps author and publishers understand which books have word-of-mouth potential and with what kind of reader. And then we also look at whether a book is more of a small screen (phone) or big screen (tablet/PC) read and much more. We are only scratching the surface right now. Currently we conduct test reading campaigns with authors and publishers where you receive a full copy of the book in exchange for your reading data. 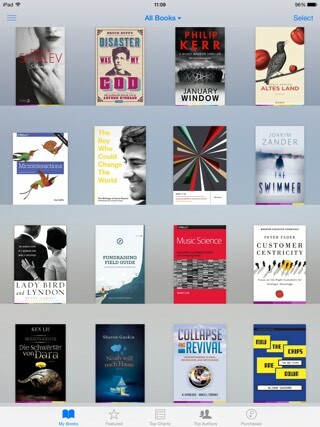 Soon, we will start offering super-size book samples that provide you with 20-50% of the book for free. If you read these and send us the reading data, you get entered into a price draw for the full book or some sweet treats. We are also experimenting with reader analytics for retail copies, that is books you purchase, a kind of “Fitbit for books”, but this is still in the very experimental stages and some time off. So come and join us in this literary adventure of discovering the way we read!